Hatches: Sulphurs are coming of well on the South Holston, and with generations schedules offering ample wading time now is the time to get out there and experience the thickness of the Hatch. Midges will be moving when the Sulphurs aren’t, and even when they are but the fish won’t pay attention. Caddis and Sulphurs will get a good bit of action on the Watauga but don’t forget your crane fly patterns and Stonefly imitations. Fly Suggestions: CDC Comparaduns are a must this time of year, but have a couple other imitative patterns such as the Silhouette Dun, or PMD Pull Over. 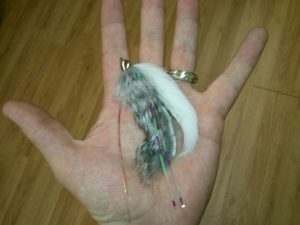 Split Cases and Yellow Soft Hackles will also pull fish. For the Watauga, Headlight Caddis, Spotlight Emerger, CDC Comparaduns will all do well up top. Underneath, try Boss Hogs, Mercer’s Z-Caddis, Purple Princes, Pink Copper John’s. General Information: Now is the time to be wading the Holston! The Hatches are coming off strong, and the fish are eager when the hatch arrives! A lot of time that will coincide with the mid-day pulse from the TVA so be aware of your surroundings and don’t get washed down stream. Pick specific fish and work them. Adjust your techniques for that fish, otherwise all the rising fish can be over whelming. For the Watauga great numbers have been coming to the boat, but the size of fish has been the trade off a lot of times. If you find your self getting into the cookie cutter (same size) fish, change your techniques and throw large streamers or even better yet large Terrestrials. Projected Conditions: Conditions are expected to be similar over the next week or so with the chance of heavy afternoon thunderstorms. When the booms start to crack get out of the water, they will pass quick enough. That one extra fish isn’t worth the dangers!